John Hibbs founded The Hibbs Lupus Trust in October 2011 and is responsible for setting the charity's strategic aims, its overall management and leadership. 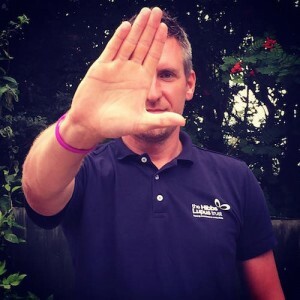 Working voluntarily, John has built several corporate partnerships and successfully secured charity of the year with organisations to both raise funds and awareness for the charity. He regularly speaks at events and gives talks about lupus and the work of the Hibbs Lupus Trust to local business and organisations. John has successfully raised the profile of lupus through the charity's use of social media and its website; he has gained the support of several MPs. In 2009, Sarah Brown hosted a Downing Street reception to help John raise awareness. This was the first Downing Street reception to have been organised through Twitter! Always up for a challenge, particularly if raising funds for the charity, John has twice completed The Virgin London Marathon and also cycled 200 miles in under 19 hours from Lupus Way in Liverpool to Lupus Street in London. This is in addition to taking part in several half marathons, walks and fun runs. In 2013, John was recognised for his outstanding contribution to Staffordshire when he was shortlisted for the Staffordshire Volunteer of the Year Award. In 2014, 2015 & 2016, John was listed in the Top 30 Social CEOs for his work with The Hibbs Lupus Trust. If you would like to find out more about how your organisation could get involved with the work of The Hibbs Lupus Trust please get in contact.